Benji Guill is a native of Livingston County. Raised in Ledbetter, Kentucky, he is a 1995 graduate from Livingston Central High School. He is married and has two children; a daughter and a son. He is an active member of the Kentucky Jailer's Association and has served in the past on the Kentucky Jail Standards Commission. He has also a Kentucky Colonel and a Duke of Paducah. Livingston County Jail was closed as May 16, 2005, due to new state regulations. Kentucky currently has 36 counties that their jails are closed. These County Jailers are responsible for transferring all people that are arrested to another jail to be held. The Jailer also transfers all inmates to all court appearances and various other appointments that they might have during their incarceration period. Livingston County Jailers Office transports well over 1100 inmates per year. The Kentucky Constitutions of 1792 and 1799 did not refer to the office of jailer. Article VI, Section 1 of the 1850 version required each county to elect a jailer, and two provisions of the present Constitution refer specifically to the office. Section 99 provides for the election of a jailer in each county. The Kentucky constitutional provisions relating to the office of jailer are unique. No other state constitution refers to jailers (Legislative). In most states, the sheriff or a sheriff's deputy would perform the duties of jailer (Wager). 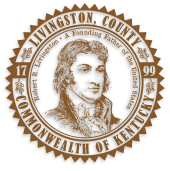 Livingston County Fiscal Court has contracted with McCracken County Jail to house all inmates. Bonds being posted shall be posted at the Livingston County Justice Center. Bonds being posted after normal business hours can be posted at McCracken County Jail. ROR Bond or OR Bonds - Return own recognizance. This bond requires an individual to sign stating they will return on their appointed court date. Surety Bond - A surety bond requires someone of the Judges choosing to sign, most commonly a spouse or parent, but does not require any money at the time of release other than the jail fees; however, the bond does state a monetary amount and the signer assumes that burden if the court date is missed. Unsecured Bond - Has a monetary amount assigned to it but does not require money at the time of release. This bond is much like a Surety Bond but can be signed by the person being released. Jail fees are to be paid. Cash Bond - has a monetary amount that must be paid in full along with the jail fees before being released. Partially Secured - Has a monetary value and a percentage of that must be paid before release. The total amount and the percentage to be paid are both set by the Judge issuing the bond. Property Bond - This type of bond has a monetary value and is allowed to be secured through the use of property and or Stocks, Bonds. This can only be done at the Justice Center. The judge is the only one that can authorize a property bond. Supplement Conditions - The judge can add conditions to any bond. During the time the bond is in effect the person under the bond will need to abide by the conditions and the person signing as a surety can be held responsible to make sure the person abides by the conditions or less the bond money posted. For questions about receiving phone calls from inmates, please call Combined Communications at 1-877-570-4268 or visit them online at http://www.cpcjail.com/index-inmate.php. Telephone calls shall be routinely monitored and the inmate shall be notified through general postings throughout the Detention Center that all calls made may potentially be recorded. Telephone privileges may be suspended for a designated period of time if telephone rules are violated. Weekenders - Anyone sentenced to serve weekends must pay all fees in full at time of booking. Pending on days sentenced will apply to fees. Circuit Work Release - Fees will be paid weekly with no exceptions. District Work Release - Fees will be paid weekly with no exceptions.